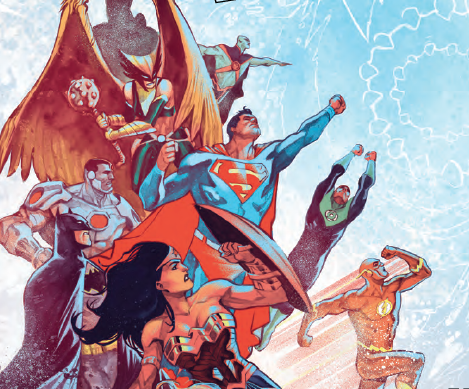 Justice League #11 Review – AiPT! ‘Drowned Earth’ is shaping up to be a game changer for the DC universe. DC Comics’ biggest event since Dark Nights: Metal is arriving at its second chapter this week and the heroes’ prospects are looking bleak. Scott Snyder has put our heroes backs to the wall in excellent form since taking over Justice League with high stakes after high stakes. In this issue, Batman is confined to a chair, Superman is scared, and Aquaman is about to be executed. Not looking good, guys. “DROWNED EARTH” part two! The Justice League is scattered across the Seven Seas, pursued by the Ocean Lords and their army of alien mercenaries and constantly at risk of turning into fish monsters. You know, just a day at the beach. Their only hope lies in the crippled Aquaman, who believes the road to victory lies in unleashing equally vengeful gods on Earth’s oceans. Meanwhile, Batman guards the Totality in the sunken Hall of Justice, where no one can attack him…or can they? Francis Manapul and Scott Snyder have been making sweet, sweet music on this series and they’re back at it with this second part to a larger story. Fans of the Legion of Doom should not miss this either since their plans become more clear and it’s becoming much more obvious their part in the flooding of Earth is huge. Fine, you have my attention. What’s good about it? This issue is quite good at giving each set of heroes something to do while enhancing the fantastical elements. Mera, Superman, and Flash for instance, go to an ancient tomb of sorts that we didn’t know existed. Wonder Woman and another hero are visiting a place nobody has in eons. This is effective at giving the story a bigger scope and making it feel more important. Sure, they might be locations that won’t matter in 6 months, but it’s a fun way to enhance the fantasy elements and give weight to what is going down. This series under Scott Snyder has consistently felt like it was changing the game in the DC universe forever which makes you take notice and puts you on the edge of your seat. With every issue Manapul is defining his career just a little bit more in the epic realm of comic books. Kirby was adept at capturing the size and scope of a moment even if it was simply a character getting punched in the face. Manapul excels at that and more making new locations look hugely important and, well, huge in size. It’s one thing to draw muscly heroes punching, but Manapul has a gift when it comes to design and making an atmosphere that changes how you feel about what you’re seeing. Take for instance a moment where an ancient god sits displayed before the heroes. He’s sitting on a bone throne, his giant weapon eerily masked by smoke with specks of black kicking up. Then you’ve got giant chainmail links dangling as if in a sad way. There’s a lot going on in each image! It can’t be perfect can it? Story wise this is an issue that moves characters around on the board, but doesn’t say much about who they are. The villains in particular are absent, especially the new water gods from space, which further focuses your attention on the table setting. It’s all well and good, but it lacks a bit since the focus is off characters. This issue also continues a superhero team book trend of splitting up the heroes while the villains amass power and advantage. It’s all well and good I suppose, but you just know when Martian Manhunter shows back up, or Batman and Superman finally get into the same room together the tables will turn. Another good issue in the series and a great issue in the event. “Drowned Earth” is shaping up to be a game changer for the DC universe. A strong second part in the event kicks it up a notch. Drowned Earth" is shaping up to be a game changer for the DC universe.